Amsterdam's Filling Pieces presents its excellent Mountain Cut low-top in a new "White Ostrich" colorway. Amsterdam's Filling Pieces released its excellent Mountain Cut low-top in a series of new looks this week, including a luxurious White Ostrich colorway. 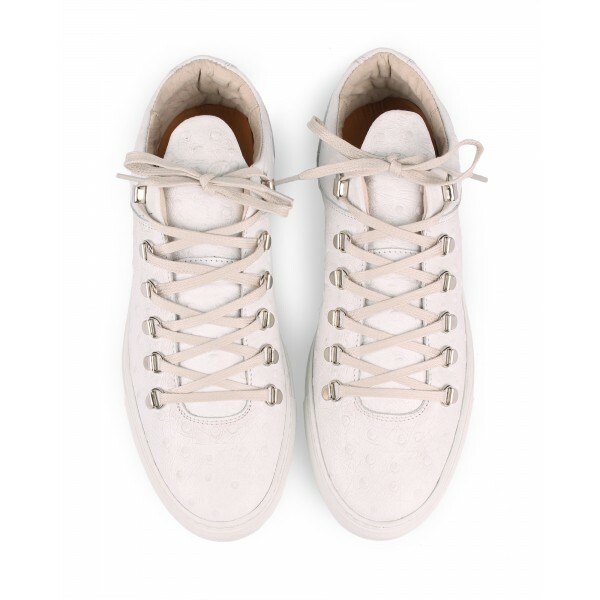 Handmade in Portugal, this Mountain Cut colorway features an all white premium leather upper with ostrich pattern embossment, all sitting atop a simple MARGOM sole. Rich pigskin leather lines the interior of the shoe, while metal D-ring lacing breaks up the otherwise monotone build. The "White Ostrich" Mountain Cut low-top is available now at select Filling Pieces retailers and online in the FP webstore.